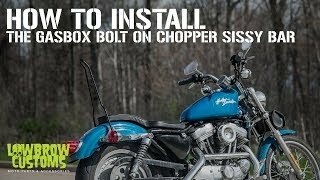 New from the Gasbox- "The Traveler" Bolt On Sissybar for 1994-2003 Sportsters. This bolt on kit allows you to mount a sissy bar to your stock swingarm motorcycle. No more worrying about how to secure your gear! This sissy bar is a direct bolt on for 1994 to 2003 Harley Davidson Sportsters. Simply remove the stock frame rail cover hardware, and bolt the new sissy bar on with the original hardware. Featuring black powder coat to protect it from the elements. Bolts right on, no problems. Very sturdy and just right height, have already had all my camping gear strapped to it. Glad I chose this one. Guys at Lowbrow are always on top of shipping as well. This thing is sick. When the babes throw their underwear at me at the end of the night, I use this sissy bar to display them. Without it, I would be a pervert with a pocket full of underwear. Good quality and fit perfect. Very easy to install. Shipped fine, bolted right up, looks cool, good quality not flimsy. I love it.